who shared with me sixty years worship in Drumbeg, fifty two of them as my wife. In these times when 'window' is a hackneyed word, I hesitate to describe the articles in this publication as windows, and yet that is exactly what they are: a series of windows shedding a little light upon past events and upon the lives of those who served God in Drumbeg. Most of the articles are based on parish records and personal recollections. Where other sources have been consulted, they have been acknowledged. The production of this book has been made possible only by the cooperation of many who have given me access to records relevant to the history of the parish: the Rector and Churchwardens; the Public Records Office for Northern Ireland; the Linenhall Library; the Central Library, Belfast; the South Eastern Education and Library Board, Ballynahinch; the Diocesan Office staff; local historians, Eileen Black and J. Fred Rankin; and those who have supplied personal records, family histories and photographs. All have given me the most courteous assistance, for which I am greatly indebted. Most of all I want to thank Mrs Collette McKee, who endured the trauma of preparing this manuscript for publication over a period of two years. To Dr Brian Turner for reading and commenting on the final script, my grateful thanks. To Mr J. Fred Rankin whose corrections and criticisms compelled me to re-examine the text and present a more accurate history, I am much indebted; any remaining errors are mine! I am also grateful to Mrs Susan Irvine of Dromara, for the loan of the drawing of the 1798 church, used on the cover of this book and to Mr Jim Neill and Dr Colin Boreham for their invaluable help with photography. I am privileged to write this word of introduction to Mr. Matt Neill's delightful pen portrait of the Parish of Drumbeg. His life-long association with the Parish and area provides the quality of insight and knowledge invaluable to the writing of local history. His love of the community in that setting is the ideal emotional and empathetic context for a recollection of people and events. His fond links to the Parish Church of St. Patrick have shaped his interpretation of life in all its moods and seasons. Behind the authorship of this publication there is an immense amount of hard work in researching facts, interpreting their significance and weaving them into a pattern that is interesting as well as informative. Matt Neill has accomplished these various tasks with excellent results. I offer him my congratulations and my thanks that in one more Parish of Down and Dromore Diocese the setting, events and people who comprise the Church have had their story recorded for present as well as future generations to read and enjoy. + Gordon Down and Dromore. Because of the images this word conjures up, the earliest days of human occupation of the Lagan Valley are visualised in the Great Rath. These prehistoric people were largely nomadic, moving along rivers, lakes or coastlines, hunting and gathering and living for short periods in temporary seasonal camps. They predated the Rathmore homestead type of dwelling by thousands of years. or forty may have existed in our parish area in the early Christian era, only one or two have been partly excavated. Most were destroyed in the cultivations of the eighteenth and nineteenth centuries. Nevertheless the name Rathmore implies a precedence over all the others and suggests a sort of headquarters of the important personages of the times. Just outside the parish boundary, the `Giants Ring' at Ballynahatty is another vivid reminder of the ancient peoples who were the inhabitants of what we now regard as our parish, the Parish of Drumbeg. The history of the parish may be said to date from the taxation of 1306 but, in order to get a better idea of its creation and development, it will help to look briefly at the earlier history of the Irish church. The seven centuries from the time of St Patrick until the beginning of the 12th Century may be called the Celtic period, when the church was monastic in character in a distinctive way4, not bound by ties of poverty and obedience, but independent of Rome. She differed from Rome in the way Easter was determined, in the way the monks shaved their heads, in the method of ordination (one bishop sufficing in the Irish church where three were required in Roman practice), in the question of married clergy, in baptism, in confession, which was public; and in Ritual and Liturgy.5 During this period, the great flowering of monastic art and missionary zeal earned for Ireland the name of the Isle of Saints and Scholars. The division of Ireland into Dioceses and Parishes is generally regarded as having begun at the Synod of Rathbraisail in 1111 and from 1140 onwards Roman practices were gaining ground. Malachi, Bishop of Connor and later Archbishop of Armagh, desired to have diocesan structures reinforced and put under papal control. At Skerries in 1148 he gathered a small synod at which it was decided to ask for `Palls'6 from Rome. The synod of Kells held in 1151 confirmed the decision, and agreed to ask for four `Palls'.6 Again, at the synod of Cashel held in 1171 with the Papal Legate presiding, the Irish Church was brought into line with Rome on the main issues that had divided the Celtic church from Roman practices in Baptism, Confession, Celibacy, Ritual and Liturgy.7 It was probably around this time that the first church was built in Drumbeg. * Palls - Pallia: Vestments worn about the shoulders showing that the Archbishops held their authority from the Pope. In 1152 they were bestowed on four Archbishops - Armagh, Tuam, Cashel and Dublin. The Papacy, fighting wars in the Holy Land, had begun to incur heavy losses and, in order to finance the depleted Vatican treasury, a series of taxations was introduced, the best known of which was by Pope Clement V in 13068. In the list of parish valuations for Down, Connor and Dromore edited by Dr Reeves, noted scholar and historian and later Bishop of Down, Connor and Dromore (and who incidentally lived for a time at Conway House near Dunmurry), the Diocese of Down had 126 Rectories, Vicarages and Chapels divided into five deaneries, one of which, Dalboyn, contained the Parish of Drumbeg and one other named as Cloncolmac, which is believed to have been near Dunmurry, but the site is now forgotten. In 1306 the parish of Drumbeg was tithed at one mark for a payment of 16 pence. That is the first record of the church and parish in ecclesiastical history and may be said to be the beginning of recorded history, continuing into our own time, almost 700 years. However, the next three centuries are nearly blank as far as our knowledge of the developments within the parish are concerned. There was a gradual decline in the fortunes of the church. The country was impoverished and subject to raiding campaigns by the English. The Bruce wars of 1315-18 left a trail of unbroken tribulation and havoc. The Dioceses of Down and Connor were united in 1441 in an effort to preserve this north eastern corner as a viable unit.9 The general state of Ulster was one of anarchy. To obtain a wider knowledge of the secular history of Ulster would entail a repetition of the internecine strife between the O'Neills north and south and the various clans who sought dominance over several centuries, the effects of the Viking attacks on them and on the countryside, the coming of the Normans between 1169 and 1300, the establishment of the Anglo-Norman `Earldom of Ulster', and much more than the limited scope of this study of our own church's history would permit. The many excellent histories of Ireland available to those who wish to delve more deeply into these chaotic years can be found on the shelves of libraries everywhere. Of course, these events disrupted the ancient Celtic church, modified its structure, destroyed much of its culture and eventually changed its practices for hundreds of years but that, too, is a subject for those who wish to study in depth. In their efforts to subdue the unruly clans of Ulster, several English Kings promoted continuing unsuccessful attempts to reduce the Irish and the Anglo-Normans to obedience to the Crown and English Law. The destruction of churches, monasteries and Christian foundations without discrimination went on during these incursions and wars. 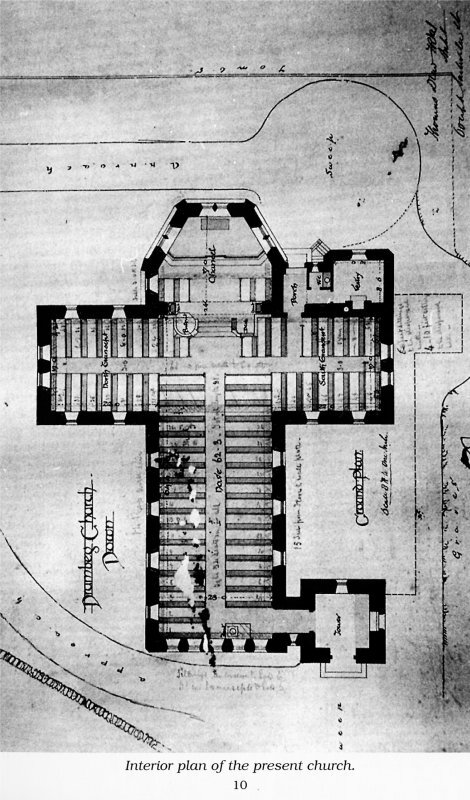 The reorganisation of the chapters of the Cathedrals of Down, Connor and Dromore was begun when James I granted a charter on 20th July 1609, establishing a Dean and chapter for each of these three dioceses.11 The dedication of Down Cathedral was changed from St Patrick to the Holy Trinity, which had been the original dedication prior to the foundation of the Benedictine monastery by John De Courcy in 1183. The chapter was to consist of one Dean, four dignitaries and three Prebendaries, all of whom should be priests. Each of the dignitaries was granted a number of Rectories and Vicarages. In the charter of 1609, John Blakeborne was ordained Archdeacon and granted the rectories and vicarages of Killclief, Kilbegg, Rosglas, Drumbo, Drumbegg and the chapel of St Malachie with all their rights, members and pertinences. John Blakeborne was therefore the first Rector of Drumbeg, holding the incumbency as Archdeacon of Down. The duties of caring for the souls in the parish was carried out by Curates who are listed under `Curates and Rectors'. Thus, for just over 200 years, the title of Rector was properly ascribed to the Archdeacon of Down until the dissolution enacted in the church Temporalities Act of 1834. This arrangement continued until the death of Archdeacon Mant in 1834, from which date the incumbent of the parish is referred to as Rector. It will be observed that the parish of Drumbo had no church in repair at this time and that William Firbus (Forbes) is listed as Curate of Drumbo and Drumbegg. Fred Rankin, writing in the 'Heritage of Drumbo', states that Drumbo had been without its own place of worship for almost 600 years (in 1792) and was united to Drumbeg which possessed a church in repair. The Lagan navigation from Belfast to Lough Neagh passes through the parish. The principal seats, beside those noted under the heading `Dunmurry', are Glenburn, the residence of F. Crossley, Esq. ; Wilmont, unoccupied; Finaghey, of J. Charley, Esq. ; Larkfield, of Henderson Black, Esq. ; Drumbeg Rectory, of the Revd. J.L.M. Scott; Drum House, of W.H. Smyth, Esq. ; and Belvidere Cottage, a neat and commodious residence, lately built on the property of A. Durham, Esq. Ballydrain, the beautiful demesne of Hugh Montgomery, Esq., though not in this parish, is within 200 yards of the church, and with the adjoining grounds of Lakefield, the residence of Miss Richardson, and Lismoyne, of Mrs Callwell, presents one of the finest landscapes in the neighbourhood of Belfast. A court leet and court baron are held every third week at Four Land Ends, for the manor of Drumbracklin, by a seneschal appointed by Narcissus Batt, Esq., lord of the manor, with jurisdiction for the recovery of debts under �20, extending over the town lands of Doneight and Lisnoe in the parish of Hillsborough, Ballyaulis in this parish, and Ballycairn, Ballylesson, Molough, and Knockbreccan in Drumboe. The living is a rectory, in the diocese of Down, and is the gift of the Bishop; a part of the rectorial tithes is impropriate in W. Charley, A. Durham, and Narcissus Batt, Esqrs., as lessees under the Marquess of Donegal. The tithes now amount to �336. 16. 6., of which �94. 13. 6. is payable to the impropriators, and the remainder to the incumbent: the Glebe-house was built in 1826, by a gift of �415 and a loan of �46 (British) from the late Board of First Fruits, exclusively of �450 expended by the incumbent in building and improvements; the glebe comprises eight statute acres. The church was rebuilt by subscription in 1795, by aid of a gift of �461 (British) from the same Board: it has a tower surmounted by a spire, which having been blown down in 1831, was rebuilt at the expense of J. Charley, Esq. About 300 children are educated infive public schools, , two of which are on Erasmus Smith's foundation. The Church of Drumnow, now the parish of Drumbeg, derives its name from the Irish, Druin beag, a little ridge. Part of this parish is in the Country of Antrim but the County Down portion contains a population of 2,444 persons, the total inhabitants amounting to 3,627. A part of the ancient manor of Drumbrackan, or Downbreaklyn, was in this parish, the remainder being in the parishes of Hillsborough and Drumbo. Drumbeg, from being intersected by the river Lagan, was sometimes called 'Drom in the Lagan'. Hugh, the second Lord Viscount Montgomery, in 1639, granted in trust for his brother, Captain George Montgomery, the manor of Downbreaklyn, and all the `townes', lands and hereditaments, thereto belonging, with the power to hold Courts leet, and baron, of the said manor, with all the usual appurtenances of castles, houses, fishings, etc. George Montgomery built a house at Drumbrackley where he resided. He was called by `ye agnomen of Kinnshoker, Anglice, hawk head, from Ceann, a head, and Scabhae, pronounced showak, a hawk'* . He was buried at Newtownards. In more recent times the courts leet and courts baron were held at Four loan ends, the appointments of officers being made by Mr Batt of Purdy's Burn, into whose possession the manor had passed by purchase. The church of Drum corresponds principally with the modern parish of Drumbeg. * Nicknames were very common. Thomas Finlay is listed as curate in 1733 - 38. How long was he incumbent of the joint parishes? Despite extensive research we do not know. The question is of more than academic interest, since his successor presents quite a problem in determining how long he was curate. In the visitations of 1757/8 and again in 1760, Vesey Hamilton is given as Curate, but in the visitation held in the parish church Lisburn, on Thursday 16th August 1781, William Lindsay is listed as Curate of Drumbo and presumably Drumbeg.18 Now to look at his career and see the difficulty. William Lindsay was born in 1747. He became Curate of Tullylish in 1770 and of Donacloney in 1772. As we saw above, he is listed as Curate of Drumbo in 1781, before he is mentioned as Curate of Drumbeg in 1817. In Connor succession lists he was Rector of Layde from 1797 - 1822. He died on 15th December of that year. According to the Belfast Newsletter, he had been incumbent of Drumbeg for fifty years. And that, as they say, is the snag. How could he have been 50 years in Drumbeg and 25 years as Rector of Layde which is fifty miles away? And why did he leave us when a new church was being built? If he did, we have no record of any other who ministered in Drumbeg from 1797 until the appointment of the Revd. J. L. M. Scott in 1823. The Revd. Wm. Lindsay is mentioned (as above) curate of Drumbeg in 1817. So it would appear that whatever the answer may be, he was most probably our spiritual leader when the church was built in 1798. * That auspicious date allows us to examine the momentous events of the times. Lisburn Historical Society Journal, December 1979, Vol. 2. Whelan, C.B. (1928) The Prehistoric Hearth of Greenoge. Dunmurry. Irish Naturalist Journal, Vol. 1-2, 1928. Humphrey Case (1968) Settlement Patterns in the North (Neolithic). Ulster Journal of Archaeology, Vol. 32, pages 8-11. The Church of Ireland - A History. Kenneth Milne, page 4. Synopsis of Irish History - Glenavy Past and Present. Charles Watson, M.A., B.D. (T.C.D. ), 1892, page 45. The Church of Ireland - A History. Kenneth Milne, page 12. Synopsis of Irish History - Glenavy Past and Present. Charles Watson, M.A., B.D. (T.C.D. ), 1892, page 46. Reeves: Ecclesiastical Antiquities, Dublin 1847. A History of Drumbo. J. Fred Rankin, page 12. A Traveller's History of Ireland. Peter Neville, pages 72-73. A History of Drumbo. J. Fred Rankin, pages 12-13. Mant, W.B. Memoirs of The Rev. Richard Mant, page 16, Dublin 1857. A. Knox History of Co. Down. The Heritage of Drumbo. J. Fred Rankin. * Mr J F Rankin has researched this conundrum and concludes that the duties at Layde were carried out by Curates, with Revd. Wm. Lindsay as Rector in absentia. The Belfast Volunteer Company were undertaking the traditional roles of local and national defence. Soon others were formed. They were a fairly exclusive club, since only men of some substance were able to bear the expense of belonging to a civilian army dependant on its own resources. They were armed with flint lock muskets five feet in length or seven feet with bayonet fixed. Having to buy their own uniforms, arms and sundry kit, as well as losing earnings while serving, meant that only the more prosperous levels of society, well-to-do merchants and tradesmen, students, better off tenants of the local landlord's estates, and so on were able to afford to belong to the local Volunteer Company. The Drumbridge Volunteers belonged to the Reds battalion of the Sixth Ulster Regiment, which had another battalion, the Blues, in its Constitution.3 The Reds wore a red uniform with blue facings. As they marched down the Bell Hill, over the Lagan bridge to the old pre-1798 church, past the Bell Inn where a great crowd had gathered to watch the procession, they were indeed a resplendent spectacle. Once inside the little, long, narrow church there was hardly room for those hoping to get in. A fortnight later they paraded to Divine Service at Drumbo meeting house where they heard an excellent sermon preached by the Revd. Mr. McKee and also a exhortation well suited to the present times. We meet them again on manoeuvres in the article on the Drum House. When Lieutenant James Haddock died unexpectedly on 18 December 1657, he left his affairs unfinished. He had been in the process of finalising a lease of his property from Lord Donegal in favour of his son, John. Now the administration of his estate was left in the hands of his neighbour, Jacob Davis. Seeing an opportunity to acquire the property for himself and his heirs, Davis soon married James Haddock's widow, Arminell, and set about changing the lease and will of James Haddock. By the time the legalities were nearing completion, Arminell bore him a son whose name he inserted into the lease instead of James Haddock's son, John. Rumour of this perversion of justice had circulated amongst Haddock's fellow officers and friends but, since Davis had the affairs in his own hands, little could be done to prevent the miscarriage of justice. James Haddock had been dead for four years when one evening a sturdy young fellow named Francis Tavener was riding home towards Belfast at the end of a busy day attending to some business connected with the estate of Lord Donegal, whose servant he was. He may have been meditating on the stories he had heard about James Haddock's betrayal or maybe he was recalling the day of Haddock's funeral to Drumbeg churchyard four years earlier when he had been one of the mourners along with many of Haddock's friends and a contingent of Crown Forces. At any rate, as he journeyed along past Drumbeg churchyard it was getting late in the day, and although he considered pausing for a refreshment at the Bell Inn just outside the church grounds, he decided to press on in order to get through the heavily wooded stretch of road ahead, up the Bell Hill and on to Malone. Thus it was that, in the gathering dusk, as he passed over the Drum Bridge his horse suddenly shied violently and became so agitated that Tavener dismounted and soothed the animal. As he stood on the road at the horse's head, he became aware that the horse had become rigid and gradually a shadowy figure materialised from the gloom beside him. Although Tavener was badly scared he nevertheless demanded to know who or what was happening and a voice answered him which he instantly recognised as that of Haddock, who demanded that Tavener take action against the perversion of justice which was being done and instructed him to have his son restored to his legal inheritance. Tavener tried to break away from his ghostly detainer but the apparition threatened to haunt him until justice was done. At last Tavener managed to remount and ride quickly to his home. For some days afterwards, Francis Tavener tried to put the whole episode into the back of his mind, persuading himself that thinking about the whole matter, together with the lateness of the hour and his tiredness, had contributed to an insubstantial hallucination on that notorious stretch of road. But, just as he was beginning to get easier in his mind, James Haddock appeared to him in his own home, repeating that, until justice was done, he would never cease to haunt him. In desperation Francis Tavener went to lodge with a shoemaker friend named Pierce, who had a house close to the docks in High Street in Belfast, and here he hoped to have given the ghost the slip. Not so. Shortly, as the two friends sat around the turf fire one evening, Haddock appeared again, demanding why Tavener had not done as he had requested and assuring Tavener that if he failed to convince Jacob Davies and Arminell that they must restore the inheritance to his son he was then to take the case to Carrickfergus court, when Haddock would provide a witness. Although the shoemaker had heard and seen nothing, he was aware of his friend's distress and together they went next day to consult with Lord Donegal's curate. He referred them to Dr Lewis Downes, Vicar of Belfast, who was convinced of the genuineness of the visitation and, having failed to persuade Jacob Davis to alter his mind, he prepared a case for the Ecclesiastical Court at Carrickfergus. On the day of the hearing, a great crowd had assembled, as news of the litigation had spread through the countryside, and all were speculating as to how the case would be concluded. When the witness for Haddock's application was required, there was a roar of laughter inside the courtroom as the usher stood up and shouted `Call James Haddock' for all present knew that Haddock had been dead for five years. The laughter was mixed with cat-calls as the usher shouted 'Call James Haddock' for the second time. Complying with the law, the usher for the third time shouted 'Call James Haddock.' Immediately there came a blinding flash of lightning accompanied by a deafening peal of thunder. The building was shaken by a great gust of wind, a hand appeared on the Bible and a voice said `Is that enough?' It was enough. Jacob Davis left the court a disgraced man, to the jeers of the crowd, and in his fury spurred his horse cruelly. Attempting to negotiate a tricky piece of laneway, he was thrown heavily over his mount's head and broke his neck. Haddock has never been seen since, but the tombstone in Drumbeg churchyard lies flat and tilted at an angle. You will find it on the left hand side of the little path that leads to the new graveyard from the back door of the church. Eventually the Lord Bishop, the famous Jeremy Taylor, set up a commission to enquire into the strange story and the conclusion was reached that it was an instance of an 'authentic visitation'. This rectangular centre piece is enclosed by intricate scrollwork and finished with two border lines - all in gold. I A.B. do swear that I will truly, impartially and faithfully execute the office of church warden of the parish of Drumbeg in respect of the parochial rates and assessments, and the collections and management of the same, and the other property and monies of said parish. So help me God. Resolved that this Vestry be adjourned till first day of May next. and four other signatures as well. The next Vestry meeting, held on first day of May 1823, has no mention of a minister present. The Rector, James L.M. Scott, signed as minister. Was George Armstrong just a temporary cleric prior to a proper appointment? The minister availed himself of the option left him by law, to decline taking the chair in consequence of the unkindly spirit manifested towards him (by/and) some of the more notable parishioners at the Easter Vestry. There was not any unkind feelings manifested to J. incumbent by the Parishioners on the occasion alluded to. Signed W.E. (Church Warden). This was William Emerson. one of the wardens. Unfortunately, further information of the proceedings of the various Vestry meetings is confined to the basic essentials. The observant reader will have noted the apparent discrepancy in dates. The first minutes, and indeed nearly half of the minutes in this book, refer to the years 1823 - 1850, yet the outside cover, already described, is dated 1850. It would appear that the previous binding had become too tattered to hold the pages together, so the Rector and Church Wardens had the book recovered by George Harrison & Co., 51 High Street, Belfast, and a most excellent job they made of it. Although this period embraced the Rectorship of four incumbents and spanned a time of great social change from the famine years to the rebuilding of the church in 1870, the information gleaned from the minutes of the Select Vestries is scant indeed. Often the formula of `Meeting held on (date), Rector presided, appointments made, meeting closed' presents us with not a glimpse of the events which were shaking and shaping society during these years. Only one or two give us a clue about the effects of the terrible poverty of the famine years. On 3rd April 1839, part of the minute reads 'It was resolved that the foundling child lately thrown upon the Parish should be provided for by subscription'. Several references are made to pauper graves. Extract from minutes of Select Vestry held on Easter Monday, 17th April 1843: 'Resolved that a half-penny per acre be levied on the parish for the purpose of paying a debt due by the parish for coffins for the poor, and meeting a similar expense that may arise for that purpose'. At the Select Vestry meeting held on 8th April 1844, the names are given of seven people for whom coffins were supplied. On 12th April 1852, Officers of Health were appointed. From these few references to the 'poor' it can be seen that the famine years affected the Parish of Drumbeg, perhaps in a lesser degree than some Northern parishes and considerably less than other parts of Ireland; but in some degree that time of terrible poverty and deprivation must surely have disrupted the lives of many of our parishioners. We find it hard to imagine the conditions which prevailed in the poorest homes in the parish, and what few church records we have, shed little light on one of the greatest tragedies to befall the people of Ireland. On 24th April 1848, the minutes contain the information that the wall around the churchyard had been completed and noted that the land contained for the churchyard had been conveyed from Letitia Maxwell to the church wardens, John Charley and John Kelsey, and their successors for ever, confirmed by Act of Council 2nd December 1795. THE REVD. J.L.M. SCOTT, M.A. The first incumbent of our parish that we know for certain was James Leslie Montgomery Scott, M.A. The son of James W. Scott of Londonderry, his mother was Catherine Elizabeth, daughter of the Right Revd. James Leslie, D.D., Bishop of Limerick, and a sister of Sir Edward Leslie, Bart, of Tarbert House, Co Kerry. He was born on 10th August 1796 and he entered Trinity College, Dublin at the age of 17 years on 1st November 1813. He obtained his B.A. degree in 1819 and M.A. in 1832. He was appointed curate of Drumbeg in 1823 and remained as Rector from 1825 until 1843. The parish Register of Baptisms commences at 17th August 1823 and the last entry on this page is of the baptism of Elizabeth Ann, daughter of J.L.M. Scott and Elizabeth. It is signed by James L.M. Scott, as are the succeeding pages, until 6 November 1836. Marriages also begin to be recorded from 23rd October 1823. At the bottom of this first page and succeeding pages until 31st December 1836 is inscribed 'Copied from old registry book, James L.M. Scott'. These entries are all in the same handwriting and obviously written up from earlier records, now unfortunately lost. He continued to write up this register in meticulous detail until 1845. The register of burials commencing in 1818 until 1828 is also in the same handwriting. We are therefore indebted to the Revd. J.L.M. Scott for writing these up from earlier records; as the grandson of a bishop this would have been an essential exercise. His ministry embraced the earlier years of the famine when there was great poverty and want, and this may have contributed to the rundown of the parish which was complained about by his successor. He left Drumbeg in 1843 to go to Portaferry and became Chancellor of Down Cathedral in the same year. He died at the rectory in Portaferry on 18th October 1885 at the age of 90 years. The Revd. Gerald Wensley Tyrell M.A. was instituted to the incumbency of Drumbeg on 12th April 1843. The son of George Tyrell of Robinstown, Co Westmeath and Catherine, daughter of Wensley Bond, Dean of Ross, he was born in Dublin, educated at Drogheda School and entered Trinity College Dublin on 14th October 1822, aged 16 years. He graduated B.A. in 1827, qualified for his Master's degree in 1832, was ordained as a deacon in 1830 in Down and as a priest in 1831 in Dromore. He was instituted on 12th April 1843 and served 13 years in Drumbeg before resigning for the Prebendary of Tullybrackey, Limerick where he served from 1856 - 1884. He married Isabella Louise, daughter of Clifford Trotter of Greenwood, Clough. Her mother was Lady Mary St. Laurence, daughter of William, 2nd Earl of Howth. His incumbency at Drumbeg was marked by deep personal sorrow. Three years after his institution, on 17th August 1846, his son George died, aged nearly 15 years; on 3rd November 1848 his wife died, aged 36 years, and Catherine, his mother died in 1854. Shortly before he left Drumbeg, he was again bereaved by the death of his daughter Geraldine Sophia who was only 13 years of age. Premature death was no stranger to the Rectory at Drumbeg, then or indeed for many years to come. We are awed by this glimpse of resolute faith which enabled George W. Tyrell and some of his successors to bear the burdens laid upon them and continue Christ's faithful soldiers and servants until their lives' end. Reflecting on the incidence of early death in the rectories of our province makes us more aware of the things we take so much for granted. Inoculations, antibiotics, hygienic handling of food and the elimination of tuberculosis as a rampant killer, are among the blessings in these last years of the 20th Century. Although little information is to be gleaned from the Parish records of this period, his ministry embraced the worst years of the famine. It was he who would have had the unenviable task of giving spiritual comfort to the seriously ill, preparing for the burial of the victims within the parish and supplying comfort to the bereaved. Elsewhere we have considered the implications of the bare statement in the vestry minutes of the provision of coffins for the poor. It is true that a clergyman's ministry is always to console, comfort and carry our Lord's message of peace to all who are in need at all times but, when the accounts of the terrible tribulations of those times available to us in the many publications relating to the years of the potato famine are considered, the burden laid upon doctors and priests of all denominations must have been at times almost too much to bear. Especially is this so of George W. Tyrell who had so much grief of his own to carry. He resigned from Drumbeg in 1856. His successor, the Revd. Thomas Walker, who was Prebendary of Tullybrackey, in the Diocese of Limerick, exchanged with G.W. Tyrell and was instituted in Drumbeg on 21st January 1856. The porch tablet referred to elsewhere gives the bare essentials of his coming to Drumbeg in the words 'former Rector of this Parish'. He was instituted on 21st January 1856 in succession to the Revd. George W. Tyrell with whom he had exchanged pulpits as it were. He came from the Prebendary of Tullybrackey to Drumbeg and Tyrell went as Prebendary of Tullybrackey. Both must have been willing to make this exchange but why, or for what gain, is not now known. Address and Presentation to the Rev. Thomas Walker, A.M., Rector of Drumbeg, County of Down: Rev. and Dear Sir - We, your parishioners and members of your Congregation in the Parish of Drumbeg, cannot permit you to leave us without expressing our regret at your removal. We have for upwards of eight years had the advantage of your ministry, and enjoyed your friendship; and, whether we look back on your earnest Gospel preaching in the pulpit, your kind and comforting visits to the sick room, or your social and gentlemanlike demeanour as a friend, we cannot but sincerely regret that our connection is so soon to terminate. But while we must feel sorrow at our separation, we are truly gratified that your removal is so much for your personal advantage, and we are satisfied that if it please God to spare your valuable life, the same qualities that have endeared you to us will ensure you warm friends and affectionate parishioners in the larger field of usefulness to which you are called. Permit us also to express our gratitude to Mrs Walker and every member of your family for their exertions among us. Their instruction in the Schools, and valuable aid in the Choir, will leave a memorial behind them in the hearts and lives of many that will not be easily effaced. We would, in conclusion, beg your acceptance of the accompanying Silver Salver. Its intrinsic value is small; but we would desire to mark our esteem not by its value, but by its enduring qualities, and can assure you that, on your departure, you and yours will bear with you our best wishes and earnest prayers for your temporal and eternal prosperity. Signed on behalf of Parishioners of Drumbeg: H Montgomery and Geo. McDonagh (Churchwardens); Drumbeg, County Down, 21st April, 1864. He had married Sarah Jane, daughter of William Higgin, now Bishop of Derry, and it was probably at the instigation of his father-in-law that he left Drumbeg to become Rector of Tamlaght-o-Crilly in Co Derry until 1872. In 1866 his daughter, Isabella Folingsby, married Thomas Montgomery J.P., D.L. of Ballydrain who was High Sheriff of Down in 1885, thus forging a link with one of the great benefactor families of Drumbeg. When Thomas Walker A.M. died at Buxton on 18th August 1874 his body was returned to Drumbeg and buried in the burial ground of his son-in-law, Thomas Montgomery. The marble tablet which was erected in the porch is his memorial. The Rev. G.T. Payne A.M. Vicar of Templecrone and Kilroot was appointed to the rectory of Drumbeg on 1st May 1864. He found the church very much out of repair, requiring considerable outlay. The Hillhall and Ballyfinaghy schoolhouses were in a most deplorable state. No master in either schools. This Hillhall school was perfectly restored at the outlay of �220 raised by public subscription, and the school reopened on 13th February 1865. The Ballyfinaghy school was restored at an outlay of �109 raised also by public subscription. It opened in November 1864. The Rectory was also in many parts dilapidated requiring a new roof etc. The walls were therefore raised three feet and a new roof put on of the very best materials. A new coach house, stables, etc were built at the same time. The entire amount expended upon the Glebe at this time amounted to �658.16.2. A classic example of the new broom, perhaps! Clearly the Revd. G. T. Payne, whose portrait we are fortunate to be able to reproduce here, had his work cut out for him, and he set about doing it. He was born in Kilkenny, the son of George Payne, a farmer. Entering Trinity College Dublin in 1833 at the age of 16, he obtained his B.A. degree in 1842 and his M.A. in 1863. In 1843 he was ordained curate in Lincolnshire and priest in Worcestershire in 1844. Returning to Ireland, he became Chaplain at Carrickfergus from 1845 - 1847. As he says above, he was Vicar of Templecrone and Kilroot, where he had ministered for seventeen years. He thus brought considerable experience to the task of restoring the various properties in need of repair, which with his enthusiasm and vigour was soon accomplished. The response from his churchwardens and parishioners in achieving these most needed improvements must have been a great encouragement to him as he tackled the most important work of all. It was apparent to him that the old barn-type building was mostly beyond repair, so he envisaged the provision of a completely new church. It Was fortunate for him that he knew of a most excellent architect, Drew of Dublin, who had already made a considerable reputation for himself. Thomas Drew was the son of an eminent cleric, the Revd. Thomas Drew LL.B., M.A., D.D., Precentor of Down, and was thus well qualified to undertake the rebuilding of Drumbeg church. He and the Rector and churchwardens examined various plans for the new church and eventually agreed on the retention of the tower and spire and their incorporation into the new building. Instead of trying to reconstruct the old barn-type nave and chancel, they decided to demolish them altogether and, using the tower as the entrance, they placed the new nave and chancel with transepts to the north of the old building and thus gave us what we now regard as one of the loveliest churches in the Church of Ireland. Even so, a few modifications were needed to complete the work satisfactorily. Subject to the approval of Thomas Drew, in 1875 a lightning conductor was supplied and erected by Mr John Faulkner and again in 1906, following a fall of plaster from the ceiling (presumably a lath and plaster original) the spaces between the rafters were filled with a white board called sequoia wood by the architect who had used this effectively in St Anne's Cathedral. The Building which immediately preceded the New Church of Drumbeg was of comparatively modern date and was insubstantial and of no architectural merit, but this in its turn, was erected on a very ancient site. In the celebrated taxation of Down made in 1306, and so carefully collated by the Revd. Dr. Reeves "Ecclesia de Drum", figures as being rated at one mark, the tithe whereof was 16d. The site of one wall of this ancient edifice is in all probability indicated by the line of the raised graves, which border the walk on the southern side of the New Church. The name Drumbeg signifies the little ridge while the epithet "beg" being in all probability added to distinguish this Church from that of the adjoining Parish of Drumbo ("The Ridge of the Cow"). The same interesting document makes reference to another Church in the Parish, the site of which it is difficult to identify, named "Ecclesia de Cloncolmoc - Cluan Colmoc - the plain of Colman". A Church is known to have existed in the town land of Old-forge near Dunmurry; while again Hillhall marked on an ancient map "Down Kilmuck" is supposed by some from the resemblance of the name to be the place indicated. In the patent erecting the Cathedral chapter of Down in 1609, Drumbeg is again casually mentioned. One John Blackburne a Master of Arts, being nominated as Archidiaconus primus etc., and the Archdeaconry endowed with the Rectories of Kilcliff (Kilclief), Kilbeg alias Kilbert, Rossglass, Drumbo, Drumbeg and Capella Scanti Malachiae, now Hillsborough. The Parish remained attached to the corps of the Archdeaconry until a comparatively recent period. The New Church which is charmingly situated over the Drum Bridge in the Valley of the Lagan, is of simple architectural detail, such as prevailed in the 13th Century, and so far as it possesses distinctive character, is designed with some of the characteristics of style, which in all probability distinguished its ancient predecessor; the ancient churches of this Diocese and part of Ireland, having possessed a somewhat distinctive style of architecture. The church is built in the simple and convenient form of the letter T, transepts being without intervening Arches, and the cross intersecting at that of the nave. Beyond the top of the T the building is somewhat prolonged and terminated with the apse forming five sides of an octagon figure. This portion of the Church opens into the nave with a lofty and elegant Chancel Arch. The nave internally measuring 62 feet by 23 feet, the transepts 23 feet by 19 feet. A little apart from the southwest angle stands the tower of the former Church, a picturesque object in the landscape, grouping and harmonising pleasingly with the new building. The Spire was built by the late John Charley Esq., during the incumbency of the Revd. J.L.M. Scott and is now applied as the principal entrance to the Church, being connected with it by a short intervening passage; the old door has been removed and a new porch with a double recessed pointed arch and gable, surmounted by a finial, brings this portion of the structure into harmony with the New Church; a ceiling of moulded beams and timber stained and varnished serving as a floor for the bell-ringers has been added. At the east side of the south transept stands the Vestry, which has a separate porch, robing room etc., underneath is placed an apparatus by which the whole building is satisfactorily heated with hot water. The chancel internally constitutes the principal feature of the Church: it is of the same width as the nave and some nine feet in depth: its area however being conveniently prolonged into the nave, as a kind of platform surrounded by a stone curb, which brings the Pulpit and Desks well out in front of the transepts. The floor is laid with encaustic tiles at the expense of a member of the congregation. Each side of the Apse towards the east, south-east and north-east, is finished with a gable filled with a traceried window. Each of these windows has been filled with stained glass of great brilliancy and tone, executed by the well-known artists Messrs. Heaton, Butler & Bayne of London, the subjects being in each as follows: north-east the Sacrifice of Isaac, and the Brazen Serpent; east the Passover, and the Institution of the Lord's Supper; south-east the Agony, and the Journey to Emmaus. The southern transept has two long lancet lights, also filled in with stained glass by the celebrated Ward and Hughes, the subjects being the covenant between David and Jonathan, and the death of Jonathan in battle. The western gable which is the principal feature seen from the road has in the lower portion an arcade of six lights. In the tympanum of the gable is a long lancet light, and it is surmounted by a cross of Irish character. Internally the roofs are open timbered and stained, and in a combination of carved struts with the beams and string posts moulded and rounded-like columns; the seats are also open and stained. The chancel arch is of two orders and springs from columns of red-tinted stone with richly sculptured capitals. The pulpit is of stone, circular in plan, and enriched with sculpture. The font, presented by a member of the congregation, is of Caen stone, beautifully executed in accordance with the general style of the building. The Bible desk and Prayer desk adjoin each other; both of Oak, executed by Mr Digges of Dublin, from the architect's design, the former being presented by a member of the congregation, the latter by the architect. The Chancel chairs are of similar handsome and substantial character, and specially designed, and the gift of a member of the congregation. producing one of the most perfect structures of its kind in Ulster. Captain Montgomery, besides his subscription to the building fund, has given to the Parish at a nominal rent, the strip of land between the Church and the road, so as to afford a suitable approach. The cost of erecting a boundary wall, entrance and gate together with the lighting of the Church and some other incidental expenses, will require a sum of �200; and we trust on the 20th inst., (the day of consecration) those who are interested in this locality, as the Burial-place of their ancestors and who have not yet subscribed, as well as the friends of the Church generally, will give a helping hand to the congregation who have so munificently aided in this good work. hot water. The chancel internally constitutes the principal feature of the Church: it is of the same width as the nave and some nine feet in depth: its area however being conveniently prolonged into the nave, as a kind of platform surrounded by a stone curb, which brings the Pulpit and Desks well out in front of the transepts. The floor is laid with encaustic tiles at the expense of a member of the congregation. Each side of the Apse towards the east, south-east and north-east, is finished with a gable filled with a traceried window. Each of these windows has been filled with stained glass of great brilliancy and tone, executed by the well-known artists Messrs. Heaton, Butler & Bayne of London, the subjects being in each as follows: north-east the Sacrifice of Isaac, and the Brazen Serpent; east the Passover, and the Institution of the Lord's Supper; south-east the Agony, and the Journey to Emmaus. The southern transept has two long lancet lights, also filled in with stained glass by the celebrated Ward and Hughes, the subjects being the covenant between David and Jonathan, and the death of Jonathan in battle. The western gable which is the principal feature seen from the road has in the lower portion an arcade of six lights. In the tympanum of the gable is a long lancet light, and it is surmounted by a cross of Irish character. Internally the roofs are open timbered and stained, and in a combination of carved struts with the beams and string posts moulded and rounded-like columns; the seats are also open and stained. The chancel arch is of two orders and springs from columns of red-tinted stone with richly sculptured capitals. The pulpit is of stone, circular in plan, and enriched with sculpture. The font, presented by a member of the congregation, is of Caen stone, beautifully executed in accordance with the general style of the building. The Bible desk and Prayer desk adjoin each other; both of Oak, executed by Mr Digges of Dublin, from Mr Drew's design. The former was presented by a member of the congregation, and the latter by the architect, Mr Drew. They are both very handsome and seem substantial pieces of work. Now that the church that we know today had been built, the question of funds to provide for the debts incurred and to finance the continuing expenses of ministry was pressing. The Select Vestry surveyed the seating accommodation and decided to set up a committee to classify and assess seats, with a view to placing relative pew rents in each area, not however with the approval of the Rector. On 29th January 1892, a letter which had been sent to each member of the committee was read by Mr Payne, addressing each with the caution 'the letting of seats in parish churches is illegal unless all of the parishioners agree and with the consent of the Rector and church wardens'. Mr Payne adds that a letter from the legal authority in Ulster Chambers, Belfast, had advised that a similar attempt to charge pew rents had been tried at Hillsborough and had been successfully contested by Archdeacon Gibbs of Hillsborough. Furthermore, a letter was read from 74 members of the congregation of Drumbeg, an extract from which reads, `we are willing to pay what we can afford in a voluntary manner, but we will not agree to being classed as paupers in our own parish church'. The committee was discharged and nothing further is heard of the `pew rents' issue. Instead, on 12th February 1872, a delegation was appointed to visit the parishioners and solicit subscriptions. The first recorded parish visitation! July 1875 - Lightning conductor added to church, with the approval of the architect Thos. Drew. October 1877 - William Smyth of Drum House and Thomas Montgomery of Ballydrain joined in a lease in perpetuity consigning an acre of ground between the church and the public road to the Rector and church wardens for making a suitable entrance to the church. The Lych gate, a notable landmark in Drumbeg, was erected in 1878 by Ellen Caldwell, in memory of her brother John Ferguson Montgomery. Against this background of achievements, we look at the personal details of the life of G.T. Payne. He had married in 1845 Emily Burton, second daughter of the Revd. A.S. Adamson. She died at Dunany Glebe, having had one daughter Emily Burton Payne. His second wife was Charlotte Ismena, youngest daughter of Henry Purdon M.D. whom he married on 1st February 1848. He was a man who had known deep personal sorrow, as three of his children died at a very early age. The small memorial stone just outside the back door of our church records their deaths. Nannie Payne died 15th November 1856, aged 8 years; William Samuel Payne died 5th December 1856, aged 4 weeks; Louis Crommelin Payne, aged 5 years. Looking back on the accomplishments of his ministry, we are again left to wonder that in the midst of so much personal tribulation this strong, kindly, devout man should have been enabled to hand on to us a heritage of which we are justly proud. At the Easter Vestry in 1888 the Select Vestry noted with sincere regret the absence of the Rector and sympathised with him and his family on his weakness. They recorded their indebtedness to him. The minutes are signed by Alex. R. Ryder on 25/4/1889. The Revd. G.T. Payne M.A. died at Beechcroft, Holywood, on 27th August 1888, at the age of 69, having given twenty-four years of his ministry to the Parish of Drumbeg. He left many outstanding achievements for us to enter into, epitomised by the cruciform church on the little hill that is our spiritual refreshment home Sunday by Sunday. Alexander Roderick Ryder was born on 21st February 1852. He was the son of the Revd. Roderick A. Ryder, Perpetual Curate of Errismore in the diocese of Tuam. He obtained a scholarship in Trinity College, Dublin in 1872, continued an exceptional academic career with the Vice Chancellor's Latin Medal in 1872, B.A. Junior Modern Classics 1873, Archbishop King's Divinity Prize (2nd) in 1874, Divinity Testimonium (2nd) in 1877, Downes Prize (1st) in written composition 1877, Liturgy (1st) in 1878, M.A. in 1878, Bachelor of Divinity in1895 and Doctor of Divinity in 1911, these last two after he had been appointed to Drumbeg. He was nominated on 29th May and instituted on 7th July 1888, having been ordained Deacon in 1877 and Priest in 1878 in Down. His first position was as a Master at Armagh Royal School from 1874 - 1876. Following his ordination in 1877 for the Curacy of Seapatrick, he was Rector of Scarva from 1880 - 1882 and Rector of Tullylish from 1882 - 1888. After this succession of relatively short term appointments, he appears to have found a congenial atmosphere at Drumbeg. He was to remain with us for thirty years. Although he came into a parish that, by the leadership of his predecessor had weathered the storms of disestablishment, had a new church, much improved schools with good attendances, there was yet a great deal to be done. He was most certainly a very learned academic but he did not lack in energy, driving force or leadership. The photograph of him which we treasure shows him as a dynamic achiever, and that is what he was. The year 1895 was a very eventful one for Canon Ryder and the parishioners of Drumbeg. It began very badly. January and February saw the worst snowfalls for quite a while, with the result that attendances at services were well below normal. That is easily understood when most parishioners had only 'Shank's mare' to get to church, even if Canon Ryder had a pony which he stabled at the church during services. However on Sunday 13th January there was no service at 6pm because of 'deep snow'. The severe winter was followed by a really good summer, at least as far as the main events were concerned, and they were certainly milestones for Drumbeg. Vested in the R.C.B. were a new Rectory at a cost of �1800 of which �1100 was given by Mrs Stevenson and Miss Charley and �700 was realised from the sale of the old Rectory. Canon Ryder moved in on 21st January 1895, presumably with a lot of difficulty due to the `deep snow'. The new rectory comprised: Rectory with outbuildings, garden, stables and gate lodge - all for �1800! Also vested in that year were the Parochial Hall (cost �800) and a new day school at �800. This was the Charley Memorial School, erected in 1892 by the generosity of Mrs Stevenson and Miss Charley in memory of their brother Wm. Charley, D.L. of Seymour Hill. On 22nd June of this good summer, 92 candidates were confirmed at 3.30pm by the Bishop of Down, Connor and Dromore. There were 46 from Drumbeg, 45 from Drumbo and 1 from St George's. We have to move forward to the second triennial held on 29th June 1901 for a really big day (St Peter's Day). Again the weather favoured the events. Communion Service, in which all the newly Ordained Clergy and their friends and many parishioners took part. The occasion was a memorable one in the history of many present. On the 29th June, 1901 the Lord Bishop of the Diocese held a confirmation in Drumbeg Church, at which were presented 57 from Drumbeg, 33 from Drumbo, 33 from Lambeg, and one from St Jude's, Ballynafeigh, Belfast. The day was exceedingly fine, and the Church was filled t overflowing. The following Clergymen in robes took part in the procession - The Lord Bishop of Down, Revs. A.R. Ryder, B.D. ; W.H. Davies, B. Banks, G.D. Mitchell, A.W.V. Birney (C.M.S., India); J.D. Morrow. During the entrance of the Bishop and Clergy the hymn, 'O happy day that fixed my choice' was sung. The Revd. G.P. Mitchell read the Lesson, Acts viii. Then came the hymn, 'O Jesus, I have promised to serve Thee to the end'. The Lord Bishop from his chair at the Chancel Steps, delivered a deeply spiritual and impressive address. The Preface to the confirmation service was read by the Revd. A.R. Ryder. The Bishop explained to the candidates the nature of the question at confirmation, and asked the appointed question, and the reply of the candidates was clear and unanimous. The confirmation was then proceeded with. The Revs. W.H. Davies, G.P. Mitchell, B. Banks, H.W.V. Birney, and J.D. Morrow assisted in bringing up the candidates, whose conduct was most reverent and devout. The service was brought to a conclusion by the singing of the hymn, 'Thine for ever, God of love', by the congregation kneeling and the benediction pronounced by the Lord Bishop. After confirmation service, in the adjoining Drumbeg Parochial Hall, all the Clergy, the Church Choir, and the candidates from all the four parishes were entertained at tea. Short addresses were given by the Revs. A.R. Ryder, B.D. ; G.P. Mitchell, and B. Banks. Some of the ladies of the parish decorated the tables with flowers, and presided at the tea tables. On the following day, in Drumbeg Church, was held a special communion service for the newly-confirmed young people, and their relatives and friends, and nearly all those who had been confirmed on the previous day partook of their first communion, accompanied by members of their families. The congregation was the largest seen in Drumbeg Church for years. The collection at the offertory was devoted to the fund for assisting the poorer parishes of the united dioceses. The words `good attendances' indicate that the scholars have attended at least on thirty five Sundays in the year in one Sunday school. We have to thank Mr Reade for a Magic Lantern entertainment for the children in the Bridge House in March last, which was much appreciated. Mr Montgomery gave a most enjoyable fete to members of the Sunday school in July'. These fetes at Ballydrain were also noted in the 1893 report as were the summer outings for the Sunday schools for many years, Mr Maynard Morrison continuing the custom after the Montgomery family left Ballydrain. Indeed, some of our parishioners recall these fetes in detail and even yet get a lot of pleasure out of going over the day's events. 'Waking up in the morning with the lovely butterfly feeling in the tummy. On with best dresses or suits and well polished shoes ready to assemble at the Parochial Hall and soon get into line for the march down past the church, over the bridge and on to Ballydrain front entrance at the top of the hill. Here we rest our banner which has been carried by a couple of the sturdy boys and on which is the white lettering on a crimson background DRUMBEG S.S. About a yard square, it flutters in the breeze whilst we await the Dunmurry contingent, and they are headed by a band as well as their banners'. Recollection falters. Was it a bugle band or a flute band? Probably flute is the answer. Now can you see these 300 or so pupils with their teachers, and of course attendant clergy, as they process up the long avenue to the field adjoining Ballydrain House where their host and hostess await them. The activities are carefully shepherded and controlled: swings, games, and races, and tea and buns, and of course the interminable speeches. At long last, tired and heavy with food and excitement they all march home to their various areas. At the Parochial Hall another muster for the final prayers and thanksgiving for the blessings of the day. 1901 - The statement of parochial accounts for the year begins with Canon Ryder's address: 'A new reign; a new century; a new year'. As we take a look back now over that period of our church's history, it would seem that the activities listed inside the cover of the magazine (which is reproduced here) are surely too much for one clergyman and a curate to handle even with the assistance of Mr John Brown, the Scripture Reader, especially as the means of travel between Dunmurry, Finaghy and Hillhall, for most parishioners, was limited to walking. Canon Ryder and the Church Wardens always conclude with a vote of thanks to the many people who make these weekly meetings possible: Sunday school teachers (at this time about twenty), organist and choir, sexton, and all those who devote their time and abilities to the successful running of the Parish to the glory of God. Of course succeeding Rectors and Church Wardens continued to give thanks each year, but it seemed so much more demanding then than now: no transport, no electricity, no running water, and of course no radio or television either, indeed none of the amenities which we take for granted, and yet the enthusiastic participation of all the Parishioners in so many activities makes us wonder how they did it, and perhaps feel a little ashamed of our own sometimes half-hearted sharing in the extension of Christ's Kingdom in our parish, with the advantages that we have today. 'THE NEW CENTURY 1901. A new reign; a new century; a new year; new opportunities to serve God; new and unthought ways of advancing His kingdom; all to arouse us to renewed exertion, they call us to be watchful and strengthen the things that remain; to say `this one thing I do, forgetting those things which are behind, and reaching forth unto those things which are before, I press toward the mark for the prize of the high calling of God in Christ Jesus'. He who has blessed us in the past is waiting to be gracious to give us new strength and to win greater victories in His name'. The year had only started when the cycle of life and death is remembered. On 27th January prayers for King Edward VII were read in church for the first time. At the Easter Vestry a motion of sympathy was passed to R.H.S. Reade, High Sheriff of Co Antrim, on the death of his son Lieut. Robert Ernest Reade, King's Royal Rifle Corps, in the South African War. On 13th March 1902 sincere sympathy was expressed to Mr & Mrs Victor Coates of Rathmore on the death of their son Capt. Frederick Coates, Northumberland Fusiliers, who was killed in the Boer War. The Boer War, like the Crimean War before it, brought bereavement and grief to our Parishioners and only a few more years remained before the war to end all wars had devastated the flower of Ulster's youth. Some of this was still in the future when Canon Ryder wrote the introduction to the new century. In the parish the four day-schools, six Sunday schools, men's bible class (Tuesday evenings in Dunmurry, Thursdays in Drumbeg), women's bible class (in Dunmurry on Wednesday evenings and at Drumbeg on Thursday evenings), schoolhouse meetings (Hillhall every Sunday evening, Finaghy every Monday evening), missionary sewing classes (in Drumbeg and Finaghy at 4 o'clock on Saturdays), choir practice (each Monday evening in the Church) and, most importantly of all, the Sunday services, (Morning Prayer at 11.30am and Evening Service at 5.30pm) present a picture of intense activity. During the year (1900) meetings were held in Dunmurry Hall and the Parochial Hall. As a general rule the meetings were missionary meetings, devotional meetings, services of song and occasional lectures and concerts. A Gleaners' Union had been formed for the Church Missionary Society, of which Miss Oakman was secretary. The Drumbeg branch of the Temperance Society had 100 senior members and 45 junior members enrolled. These meetings were intended to be `pleasant evenings for the people' and were heartily appreciated and generously supported by the numerous ladies and gentlemen who kindly assisted with the musical programmes. Reading rooms at Drumbeg and Dunmurry had 50 members in each. The Parish magazine based on `Home Words' edited by the Revd. Charles Bullick, was taken by 90 subscribers. The annual report for 1900 contains detailed lists of subscribers to the Parish, alphabetically arranged, followed by financial accounts for the Sustentation Fund, Scripture Readers' account, schoolhouse meetings' account, day and Sunday schools account, bequests and interest from bequests, lists of collections for various missionary and parochial objects; Protestant Orphan Society, Zenana Missionary Society, Jews Society, Church Parochial Mission Society, Irish Church Missions, Irish Society, Special Sermons Income, with detailed collections and preachers on fourteen occasions within the year, every month except January and August, two in July, three harvest thanksgivings, and three in December; there follows the account of the Treasurer of the Select Vestry, and finally the Summaries of Collections, subscriptions and donations given between 1st January and 31st December in each year. How is that for the Honorary Treasurer and his helpers to present each year for at least thirty years, with some variations as the years go on? The early years of this century were not only very busy ones indeed, but significant in that they give us a glimpse of the bursting-at-the-seams which was to culminate in the secession of Dunmurry and eventually Finaghy as separate parishes. With the coming of the railway and the improvement of the main road between Belfast and Lisburn, the little village of Dunmurry began to grow rapidly. Under the influence of the establishment of the various linen processing plants in the neighbourhood and Crawford's Print Works on the hill, the population had increased dramatically in the nineteenth century and the desire of the resident Drumbeg parishioners to have a church of their own can easily be understood. Memorial from the members of the Church of Ireland resident in Dunmurry to the Select Vestry of Drumbeg, December 28th 1903. We the undersigned members of the Church of Ireland resident in the neighbourhood of Dunmurry, respectfully request the Select Vestry of Drumbeg to take into their earnest consideration the question of providing church accommodation in this village. We recognise fully the advantage which we already possess in the evening service held in Dunmurry Hall. But we think the time has come where the necessities of Church work in the district require the provision of a permanent church with a morning service and celebration of the Holy Communion. New families coming to the District have been reluctantly compelled to seek accommodation in other parishes, some have been led to join other Christian bodies, and many of our parishioners from varying circumstances such as old age or infirmity are entirely precluded from coming to the Lord's Table or attending Morning Prayer. In the event of the Select Vestry giving favourable consideration to our memorial, we pledge ourselves to support heartily any approved scheme for providing a District church in Dunmurry and maintaining services therein'. Signed by the 56 Heads of Families representing 261 individuals. 'Resolved - That the Rector and Select Vestry have heard with deep interest the memorial presented by Dr Gaussen on behalf of the parishioners resident in Dunmurry and regard with sympathy the desire to provide a church for the considerable population resident in that District, and undertake if the effort to erect a District church should prove successful, that they will afford all possible facilities to the new congregation for the Conduct of Public Worship'. Naturally, when the grown-up daughter wishes to leave the family home, two questions exercise the minds of the parents. Can she afford to go out on her own? And can we afford to lose her? For a year or two these questions would appear to prevent a decision on the matter. The daughter, as usual, is impatient to be free while the parents drag their heels on the question of providing financial backing. 27th June 1906:A deputation from Dunmurry attended the Select Vestry meeting. The Chairman read a printed circular requesting subscriptions for a proposed new church for Dunmurry. The circular stated 'an exceptional opportunity for taking up the work has now arisen, owing to the great generosity of Mr Victor Coates of Rathmore, who has most kindly offered to provide a site free of charge. It is estimated that a sum of �1,000 would provide sufficient accommodation for present needs. The new church would be so designed as to allow a considerable extension at a future date'. Having thanked Mr Victor Coates, the Chairman stated that he was requested to bring forward another generous offer. Miss Charley and the trustees of the Charley family desired to offer to the Representative Body, the building known as Dunmurry Hall and the grounds belonging to it for the purpose of being altered into a proposed new church for Dunmurry. In the event neither site was chosen. Upper Falls was anxious that any new church should be sited in the village so as not to infringe on their congregations. It was finally decided to build the church on land acquired from the Northern Bank, that is the site of St Colman's Church in Church Avenue today. However it was still only a proposition and it was not until 28th February 1907 that plans were submitted to the Select Vestry. The plan of an oblong church 95 feet by 38 feet sent in by Mr Jury was approved, and Dr Gaussen, Messrs. William Coates (Rathmore) St. John Herd and John Rolson were appointed Trustees for the site. That a further effort be made to reduce the debt to the Northern Bank. It was decided to thank the Bishop and to ask him what further sum would be required to be raised before he consented to open the Chapel of Ease. At this meeting, the design of a font for the Chapel of Ease offered by Miss Charley was approved and Miss Charley thanked for her generous gift. The building committee also approved the design of the stained glass for the three lights over the font. At the Easter Vestry 1908, Dr D.P. Gaussen, M.D. was appointed Rector's Chapelwarden and Mr St. John Herd People's Chapelwarden for the Chapel of Ease. Approval of Miss Treanor as organist, for six months from the date of the Easter Vestry 1908, was given. James Waring was appointed Sexton of Dunmurry. Gifts of table linens, hymn boards and books were also accepted. On the 14th October 1909, a letter was read from Mrs Andrew Carnegie offering to pay half of the cost of an organ at St Colman's Dunmurry, when the other half had been collected by the congregation. On the 31st January 1910, the Select Vestry approved an application to the Lord Primate for a grant from the Marshall Beresford Fund of �100 towards a spire or tower and a bell for St Colman's church. That the best thanks of the Easter Vestry be given to the organist and choir of St Colman's Church, Dunmurry for the way in which they render the praises of God in church, especially at Christmas and Easter. The special music at Christmas and Easter and the careful preparation for these festivals by the organist and choir deserve special mention and meet with our appreciation'. We have to turn to the Preacher's book for the date of the consecration of St Colman's on 26th April 1908. The organ was installed and opened on Saturday 19th March 1910. The Chapel of Ease in Dunmurry was obviously greatly appreciated by the parishioners in Dunmurry but it was to be twenty two years before the parish was created on the Feast of the Epiphany, January 6th 1932, when the Revd. R.C. Ellis was appointed as rector. Now to return to the Church at Drumbeg. The coronation o1 Edward VII was celebrated in fine style on Thursday 26th June 1902 by a fete held in Ballydrain, commencing at 3 o'clock, as the picture of the souvenir programme reproduced here shows. The judges, whose decisions in every case were to be considered as final, were R.H. Reade Esq., Wilmont; Thomas Montgomery Esq., Ballydrain; Robert Thompson Esq., Drum House and G.N. Callwell Esq., of Larkfield. The Treasurer was Lindsay Johnston, and the Secretary, Robert Gurd. The programme commenced with the 100th Psalm and the National Anthem, followed by drill and the presentation of medals to the schoolchildren, presentation of 'Coronation' mugs, then the refreshments for the schoolchildren. Sack races, handicap races, boot races, three-legged races, egg and spoon races, bicycle races, for boys, for girls and after tea for the schoolchildren, a competition for bouquets of wild flowers, pig race, race for men, race for women, consolation races and a donkey race. To finish the day there was a display of fireworks and a bonfire. That was a day to remember! The chairman and leading member of the Sports Committee of twelve men was Canon A.R. Ryder. The great Confirmation and Ordination Service of 29th June 1901 referred to elsewhere, was followed by a 'Quiet Day' for the Belfast Junior Clerical Society on 19th May 1903, taken by the Revd. R.H.S. Cooper. There were seventeen present. On 20th May 1910 a Memorial Service was held for the late King Edward VII, followed on 25th April 1911 by a Coronation Service celebrating the accession of King George V.
Some indication of the enthusiasm of the laity in participation of church activities has already been noted in the Harvest attendances and it is also reflected in the large attendances at the Confirmation Services of those years. Even allowing for the inclusion of boys and girls from Dunmurry, Drumbo, and sometimes one or two from other parishes, they were memorable occasions. On 19th June 1904, 92 young people were confirmed, on 29th June 1907, confirmees numbered 102, and on 28th June 1913, 106 boys and girls were confirmed. Another great Confirmation Service was held on 28th June 1913 at which 54 boys and 52 girls were presented for confirmation by Canon Ryder to the Bishop of Down, the Right Revd. Charles Frederick D'Arcy. Although the Great War had begun, nothing in the records of the Parish gives us a hint of its impact on the everyday life of the church. Indeed on 16th May 1915, perhaps incongruously one might be forgiven for thinking, a Flower Service was held in Drumbeg. It was not the kind of Flower Service we would understand by the name today. These flowers were the spring and early summer flowers from the gardens around the countryside, gathered by the Sunday school children and brought to church on that special Sunday. Some of the bouquets were of wild flowers offered as a gift to God 'for the beauty of the earth'. Even in the worst times of this war the life of the church had to go on. One of the largest Confirmation Services ever held in Drumbeg took place on 8th July 1916, when 49 boys and 65 girls were confirmed, a total of 114 young people not all, of course, from our parish. 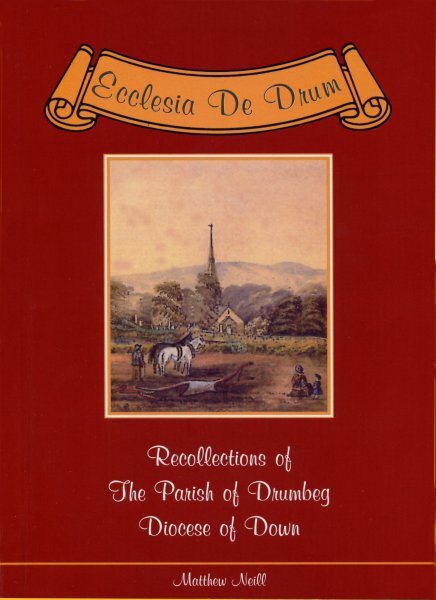 About half of those confirmed were usually from Drumbo Parish, but in this instance the Bishop had written in the Preacher's Book 'Confirmation of 49 boys and 65 girls from the Parishes of Drumbeg and Drumbo with Killaney'. The Great War changed a great many things and swept away the flower of youth of a generation, while the parish suffered curtailment by the creation of Dunmurry as a separate curacy, reducing the numbers attending the Parish Church of Drumbeg. Some indication of these changes is given in the numbers being prepared for confirmation. On 4th May 1919, there were 21 boys and 28 girls confirmed and on 4th July 1922, a total of 79 were confirmed; Drumbeg prepared 28 boys and 29 girls while Drumbo sent 6 boys and 16 girls. In 1925, 57 were confirmed and, again, in 1928 52 were confirmed. Now that the church at Dunmurry, and soon the new church of St Polycarps, Finaghy had reduced the parish to its present size, it was no longer necessary to have a curate and no longer were the large Confirmation Services held. 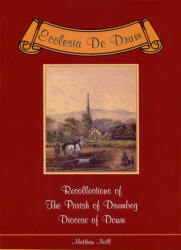 We had been re-established as the Parish of Drumbeg and our boundaries curtailed, but many great years were still ahead. Canon Ryder was married at St Barnabas, Kensington on 15th August 1917 to Beatrice Louise, daughter of George Bennett, of 44 Holland Park, Kensington. During the war 'Home Words' published a series of cards depicting, in a rather gaudy way, the risen Saviour bearing comfort to the families of the men serving in the army. By the kind consent of a relative of one of the recipients of these cards, we are able to use them to illustrate our text. Both were sent or given by Canon Ryder; one at Christmas 1916 and the other personalised one at Easter later, probably 1917. These tangible evidences of the compassion which prompted our rector to obtain and distribute them are reminders of the grim task often undertaken in those sombre days by the clergy as they carried the ministry of consolation to the bereaved. On the reverse side of the cards Canon Ryder has written 'Please remember Holy Communion 8.30, 11.30.' This was typical of this good, devout Christian man, whose thirty years ministering to the parishioners of Drumbeg were nearing an end. At the Easter Vestry 1918 a motion of sympathy was passed on the deaths of Miss Charley and Mrs Montgomery, and a letter from Canon Ryder was read in which he referred to the loss sustained by the parish in their passing. A vote of sympathy was passed to him expressing the earnest wish that he might soon be restored to health. Canon A.R. Ryder D.D., Prebendary of Dunsford in the Cathedral Chapter of Down since 1906 tendered his resignation as from 1st August 1918. Just over a year later, on 25th November 1919, he died at 48 Osborne Park, Belfast. He was 66 years of age and had given most of the years of his ministry as incumbent of Drumbeg Parish. A warm recollection of his genuine godliness persisted for many years after he had been called to higher service. At the Select Vestry held on 30th October 1918, it was resolved that a committee of ladies be requested to provide tea after the Institution Service of the Revd. C.C. Manning on Friday 8 November 1918.